Obama’s action in trying to ease his friend Valerie Jarrett into his old Senate seat will fuel cynicism about politics. Illinois, of course, is the state that gave us President Obama. It is where he cut his teeth as a community organiser and where he first began to ascend the greasy pole of politics by taking his seat in the state senate. 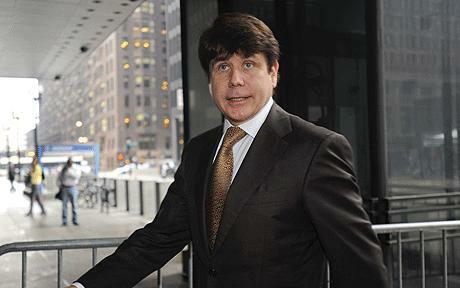 At issue in the Blago trial is whether the then governor was trying to sell the United States Senate seat that Obama ascended to in 2004 after his initial Republican opponent imploded. Blago had the power to appoint a new Senator when the seat was vacated because of Obama’s presidential election victory in November 2008. Clearly, he thought the seat was a valuable prize. “I got this thing and it’s f—— golden and I’m not just giving it up for f—— nothing,” he said in a conversation recorded by a federal wiretap. Blago’s instinct was that Obama – who he mockingly described as “this historic, f—— demi-god” – would be willing to pay to have his preferred choice be duly appointed. That choice, the trial has confirmed, was Valerie Jarrett, who now rejoices in the title of senior White House adviser and Assistant to the President for Public Engagement and Intergovernmental Affairs. Her qualification to be a Senator? Jarrett had worked for Mayor Richard Daley and chaired the Chicago Transit Board. She had been a successful businesswoman in Chicago. But she had never held elected office and her name would not even have been mentioned had it not been for her closeness to the President-elect. Jarrett was a long-time personal friend of Obama and his wife Michelle and that seemed to be qualification enough for the man about to enter the White House. Tom Balanoff, president of the Service Employees International Union’s powerful Local 1 branch, took on the role as “emissary” for Jarrett, who initially wanted the Senate seat, and testified that Obama telephoned him personally to speak about it. Next, Obama’s incoming chief of staff Rahm Emanuel spoke to John Wyma, a lobbyist, who then telephoned Blago’s right-hand man John Harris to communicate that “the president-elect would be very pleased if you appointed Valerie and he would be, uh, thankful and appreciative”. The gratitude of a President, however, is no small thing and who knows what favour Blago might have found coming his way in due course had he duly appointed Jarrett. That, of course, is how Chicago politics works – mutual back-scratching, a nudge and a wink. Blago’s problem, if the allegations prove to be founded, is that he took a much cruder and more literal approach to such matters. It has also become clear from the trial that Obama wanted to make sure that Emil Jones, then President of the Illinois State Senate and the man Obama referred to as his “political godfather”, out of the seat. Team Obama soon concluded that Blago was out of control and that the way he was dealing with the Senate vacancy could be extremely damaging to the President if he was too closely associated with it. So they pulled back and Jarrett took her White House job instead. Quite why the President who promised hope, change and transparency thought it proper to have been trying to ease his friend into his old Senate seat just days after he had won the White House has not been answered. There is no suggestion that what Obama was doing was anything illegal, improper or even out of the ordinary, at least in Illinois. He was simply engaging in politics as usual. Unfortunately, politics as usual is what Candidate Obama promised to bring to an end. Intel Researchers Develop ‘Intelligent’ Surveillance Cars That Send Video Footage From Accidents to Authorities And Even Take Over Control From Motorists.